themed b’nei mitzvot are making a comeback! themed bar and bat mitzvahs, though frowned upon by many a rabbi, used to be pretty common. mine was slightly music-centered, with sheet music centerpieces and eighth note table confetti. 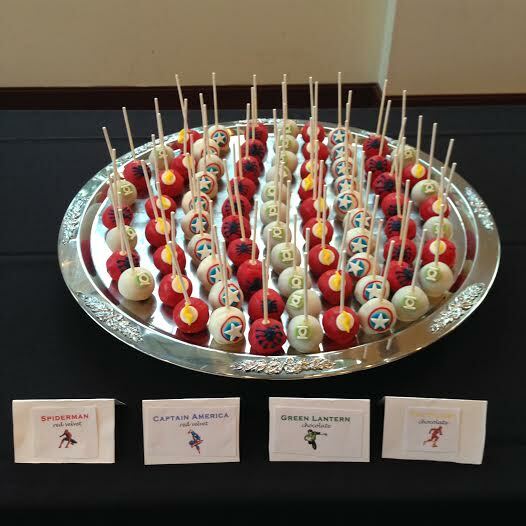 i hadn’t heard about anything like that for a while, however, until i was commissioned to make 80 superhero cake pops for a boy’s bar mitzvah. 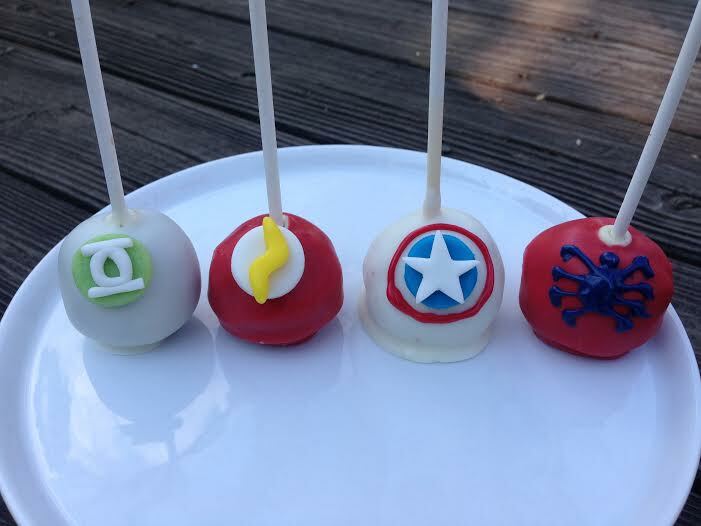 his mom emphasized that both DC and Marvel comics were to be incorporated into the cake pop design, so i decided to make captain america and spiderman (marvel) red velvet, and the flash and green lantern (DC) dark chocolate. DC, dark chocolate, haha. day one: bake the red velvet cake (i made a double recipe of this, though i only used about two thirds of the total amount), make the cream cheese frosting. wrap cake in plastic wrap and freeze. refrigerate frosting. day two: bake the dark chocolate cake (i made a double recipe of this). thaw the red velvet cake. crumble both, and add a few spoonfuls cream cheese frosting to each one. form into 80 balls (40 of each flavor), weighing each one to be 35 grams. freeze in tupperwares. day three: dip lollipops in melting wafers and insert into frozen cake pops. freeze. 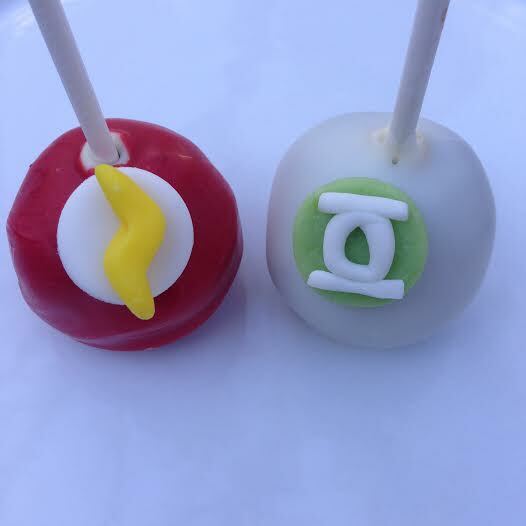 day four: make decorations for captain america, green lantern, and the flash (details below). keep in tupperwares at room temperature. day five: dip 20 red velvet and 20 dark chocolate pops in red melting wafers. let set on wax paper and keep at room temperature. add the flash and spiderman decorations accordingly. day six: dip remaining pops in white melting wafers. 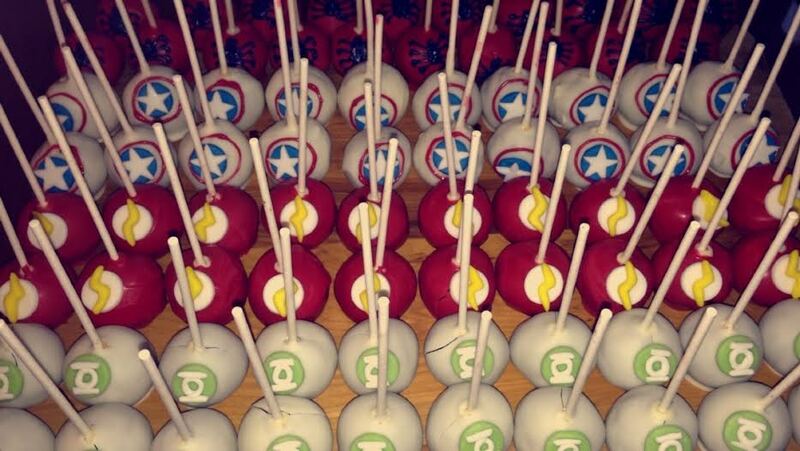 let set on wax paper, add captain america and green lantern decorations. keep at room temperature (covered or uncovered, it doesn’t matter). a lot of them did have cracked coating. this happens because the pops are frozen when they’re dipped, and then they expand afterwards. i’m not really sure how to avoid this. i’ve tried waiting until they’re room temperature to dip, but then they just fall off the stick when they come into contact with the hot coating. if you know a way around this, please let me know! the red velvet cake recipe that i use is amazing, but it contains a lot of oil. after most of the red velvet pops were dipped, they started leaking oil out of tiny holes in the coating. i was able to wipe most of it off, but it’s very time consuming to do that and some of them were still kind of greasy. you might want to use a cake recipe that just uses butter. the green modeling chocolate that i made was lighter than i would’ve liked. next time i’ll use dark dark green melting wafers in the modeling chocolate, or just fondant instead. the spiders on the spiderman pops look like bugs to me! 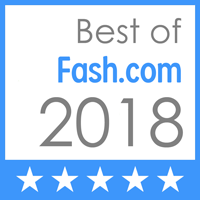 next time i’ll do a web design (pun intended) instead. 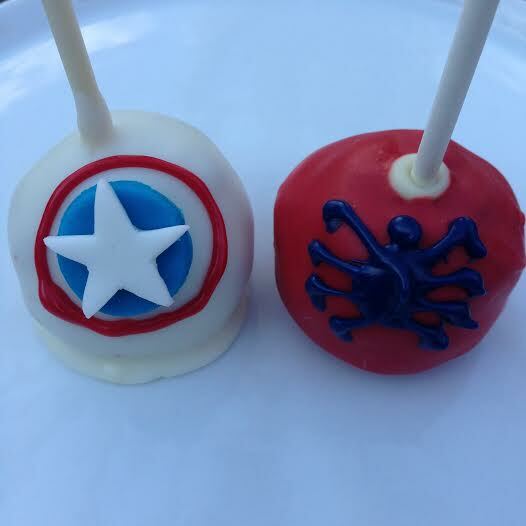 see this post on cake pops for directions on the ratio of cake to frosting. i usually just eyeball it.